One of our customers has the most beautiful garden planted with a huge variety of plants to give colour throughout the year. 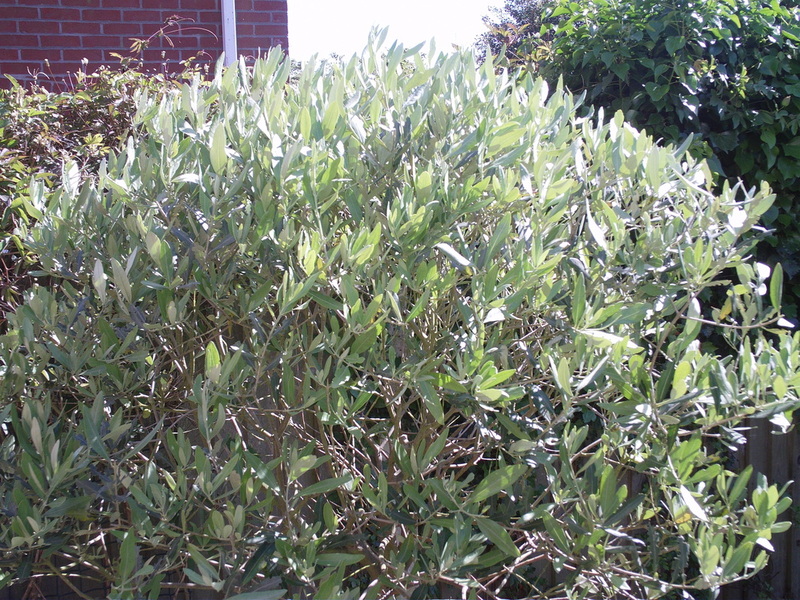 The focal point of the garden near the house is the patio which is surrounded by four ornamental olive trees and low box hedges. 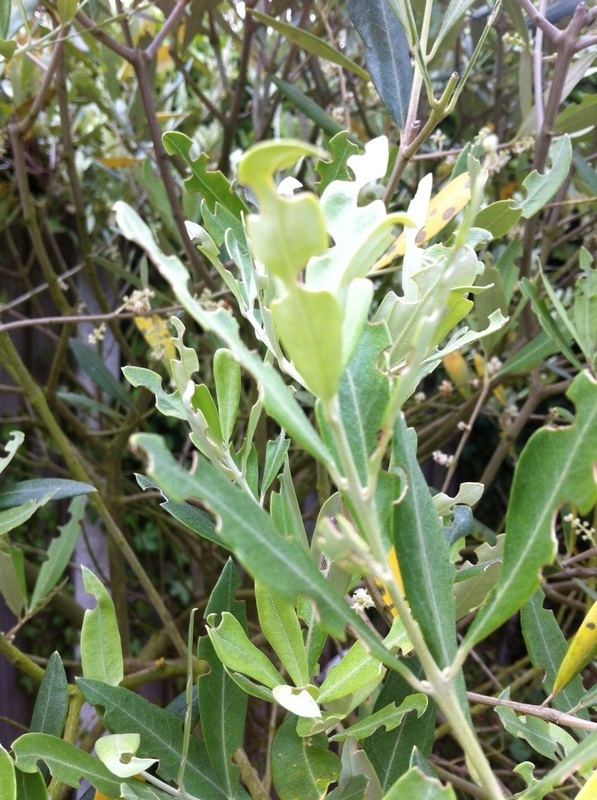 This year the olive trees have been attacked by the vine weevil along with a rose bush and also some ivy. The olive trees were not planted in pots so we were amazed that vine weevils would be interested in them. But the population of bugs is getting larger by the day. Our customer has decided to treat the vine weevils with nematodes.These little creatures are attracted to the vine weevil grubs and think of them as food. One dose applied to the soil when the conditions are right will help them to breed and multiply. Once established they head off to attack the vine weevil grubs. The vine weevils themselves have to be shaken off the trees at night, caught and stamped on. They make a real feast for the birds in the morning. Hopefully the infestation will have disappeared by the time the autumn comes and no lasting damage will have been done. The trick is to keep the soil moist. Damage to individual leaves of an olive tree created by hungry vine weevils. Slugs don't eat olive trees so that cause is ruled out. The vine weevils come out at night and feast. 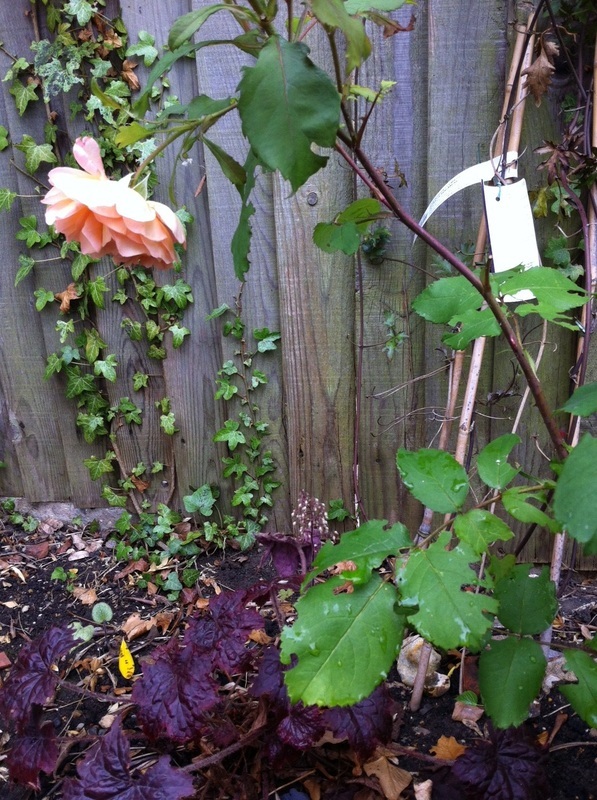 This is the garden where the colony of vine weevils have decided to live. 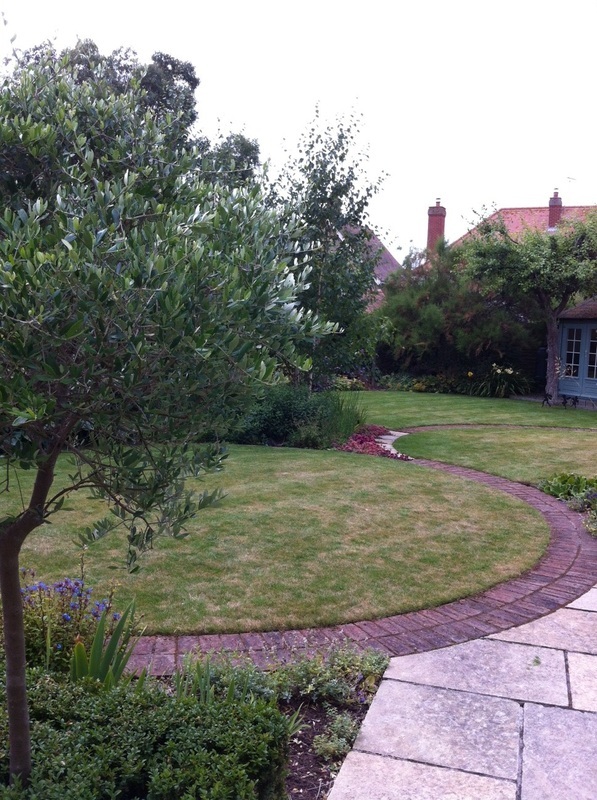 The olive tree in the foreground is the least damaged of the four olive trees in the garden. Vine weevils seem to attack anything that looks tasty with the exception of grasses. This rose is looking much the worse for wear. This is the greedy little monster which wants to consume all your pot plants, olive trees and anything else it can get its mandibles into. These are the grubs which hatch into the dreaded vine weevil. 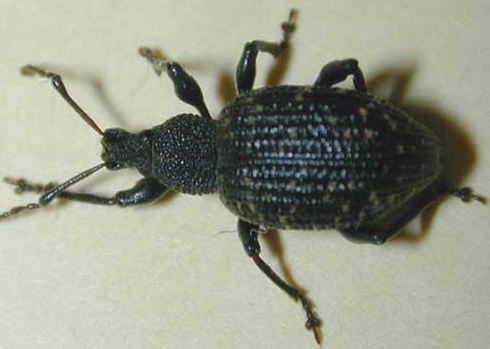 A typical vine weevil can lay 1000 eggs in a matter of weeks. Not all of them hatch but those that do eat the roots of plants often leaving the portion of the plant above the soil blowing around in the wind because it has lost its root system to these nasty bugs. This is the nematode pack which is used to treat the vine weevils. It is quick and easy to use and once the nematodes are in the soil, provided they are kept moist they will flourish and destroy the vine weevil grubs. 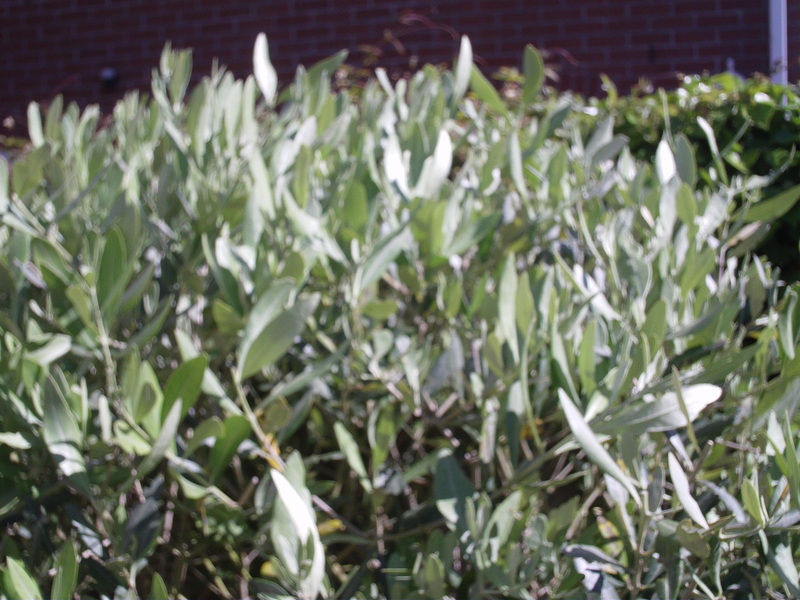 These photos are of the olive tree 12 months after the area in which it was growing was treated with nematodes. It is clearly flourishing and is no longer being eaten by vine weevils. Make sure that you get hold of some of the Nemasys vine weevil killer nematodes. They are a wonderful natural pest control system which once it is in the soil should stay there and keep further infestations of vine weevils away from your garden. It is a small price to pay for a really good solution to your problem. Just mix the nematodes with some water and water onto the roots of the affected plants. Then make sure that you keep the soil damp so that optimum conditions for the multiplication of the nematodes is achieved. Why buy six small packs when one large one will do the job for half the price. The larger pack of nematodes is a great way to deal with a really serious infestation of vine weevils. This pack from Just Green is brilliant value. The nematodes are targeted to eat the vine weevil grubs and in this packet you get enough to treat 100 square yards in old money. Get it now and put your mind to rest. Treat these vine weevils while the weather is still warm to get the nematodes firmly established in your soil. The larger pack is just the thing to get rid of ants in your lawn. Ants hate nematodes. An application of nematodes will send them scurrying! Ants are highly mobile. They can build a nest quite quickly and so if nematodes are introduced to an area where they are living they will probably up sticks and move onto another part of your lawn. Patience and an application of nematodes which covers an area much wider than the part of the lawn damaged by the nest is the key. You don't want to encourage the ants to move two feet and make another nest. The technique is to attack them on a wide front so that they disappear altogether.